Therefore, we agree that Brussels from October 15th to 17th – the EU council summit – should become the next mobilization milestone for all of us (with other de-central activities elsewhere, as in Italy on Oct 17th). Besides, we could use the period of the three days for a next Blockupy International coordinating meeting around these days. Moreover, after targeting Frankfurt and Brussels, coming to one of the major headquarters of power Berlin with a transnational mobilization on the last weekedn in April/first weekend of May 2016 (April 29th to May 1st) would be politically important and a right step in our process. Thus, Berlin could potentially be another milestone for us. We have to frame our agenda for the next year, from Brussels via physical meetings in fall and February with a larger meeting/festival, possibly towards Berlin next spring. There will be a statement with our agenda for the next year, with these (more or less concrete, more or less decided) milestones that frames our message to safe and “Europeanize the OXI”, to have physical moments of coming together as a “European referendum on the feet”. There were approximately 30 people from transnational networks as well as from political groups, trade unions and political organizations from various European regions and countries – Belgium, Slovenia, Sweden, France, Germany, Italy: Beyond Europe/ umsGanze/ Plan C; D19-20/ Alter Summit (Belgium); Attac (France, Germany); Solidaire (France), interventionist Left (Germany); Allt åt alla (Sweden), DinamoPress, Precarious Disconnections, Global Project, various social centres of Northern Italy, Esc Rome, Euronomade (Italy); DIE LINKE (Germany). We see in the negotiations a new course of conflict within the European Union. Over the past week the level of conflict in Europe intensified and we should hold up to this level in our political action. We saw many demonstrations of solidarity in Europe, including 20 June and the week of solidarity with Greece. The balance of power is clear. We are in the middle of a capitalist offensive and are facing a historical moment. There is a high level of unpredictability for the next year, the situation is very unstable. We have to be prepared for a variety of scenarios. And we have to develop a long-term agenda and have milestones of mobilization, while at the same time keeping a flexibility to adapt to the content and forms of struggles we need. A proposal to participate in the COP 21 mobilization in November/December 2015 in Paris when a large French and international coalition mobilizes to Paris on several days during the two weeks of the COP21 in November and October. => However, COP 21 is not clearly in the Blockupy agenda. 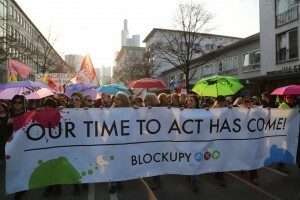 Blockupy should therefore be aware and make connections between austerity and the climate crisis. However, the COP 21 mobilization wouldn’t be a real milestone. transnationally mobilize to one of the major headquarters of power – Berlin – for the last weekend in April/first weekend in May, using the “May 1st“ mobilization as our momentum. The idea is to have a three-day choreography, in which Blockupy convenes in Berlin as part of a wider Europe-wide mobilization, opening a space for local-transnational struggles to connect. Berlin is the capital of ‘German Europe’, centre of austerity policies, but also as a city of resistance and social struggles. => The message should be to vote with our feet in the heart of the crisis regime against austerity and this kind of Europe from above. => While Friday, April 29th, could be a day to target the German Finance ministery with actions of civil disobedience, Saturday, April 30th, could be used for a multitude of local and European actions and themes – e.g. for housing and social rights, against the deadly European migration policies etc.. In the afternoon of April 30th we could convene in transnational mass demonstration inviting the (German and European) trade unions to join energizing the (local, regional, national and Berlin) May 1st demonstrations (it was controversial whether to propose May 1st as the day for a common international demonstration since for instance trade unions might not join us). There was also an update from the Transnational Social Strike network. This was discussed rather as a long term agenda than a concrete proposal. However, the transnational strike as process should be seen as as a moment of the Blockupy process. Goals evolve around the questions of how to link social, political and labour struggle, how to take back the power of strike, challenged by the growing precarity, austerity and the transnational dimension of production. => Blockupy is invited to further the common discussion at the strike conference in Poznan, October 2-4. Transnational Social Strike Meeting. October 2-4, Poznan. Therefore, we agree that Brussels in October – the EU council summit – is the next milestone to come together with many other (trans) national networks and create some strong message and coming together against the EU crisis regime. We could use the period of the three days for a next Blockupy International coordinating meeting around these days. General consensus is that after Frankfurt and Brussels, coming to Berlin with a transnational mobilization on the first weekend of May 2016 would be politically important and a right step in our process. Thus, Berlin could potentially be another milestone for us – this is however not yet decided. In particular the proposal of 1 May as the common highlight was controversial (see discussion part 2). We will frame our agenda for the next year, from Brussels via physical meetings in fall and spring, possibly towards Berlin next spring and produce a Call with the agenda of these more or less concrete, more or less decided milestones, that frames the “Europeanization the OXI” with points of convening as a “European referendum on the feet”.